PDF to FlashBook can detect the wide pages of your original PDF if you checked this option. But maybe you will face this problem: it seems some displaying problems occurred when you flip to the wide pages----this page is too wide that the flash can’t display entirely! 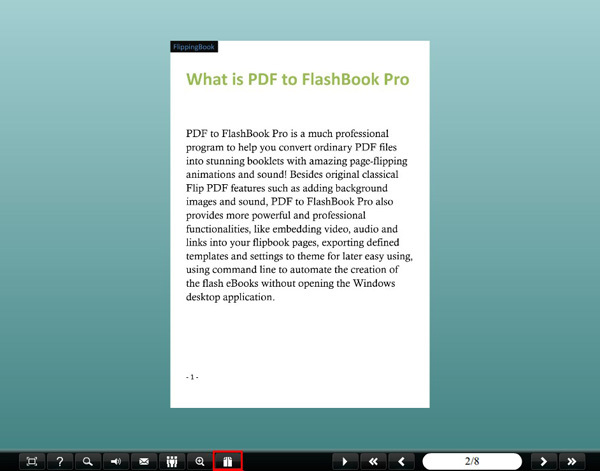 Changing your PDFs into flipping books is not the only feature of PDF to FlashBook. Excepting flipping effect, it can also create flash catalogs with slide effect and single page display mode. What’s more, you can also switch these two modes as you want. You just need to find “Single Page” option and set the value to “Enable”. After apply the change, you will see a single/double page switch button shown on the toolbar, click it to switch.